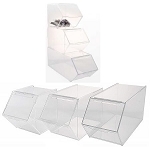 Our Top Stackable Bulk Bin can be used by itself or as the top of a 3 piece set. Stacking acrylic containers are best when counter space is limited, so you can make the most of that limited space. This clear acrylic container is great for frozen dessert toppings, bulk candy, fresh baked goods, or other pliable merchandise. The front is angled with an easy to open hinged lid creating easy accessibility for your customers. Match this bottom bin with the Middle & Bottom bins for your stacked display. Ordering is a cinch, just click and add to your cart at All Candy Containers.